Travel with Kevin and Ruth! : We made it to Italy! First thing at the airport was to pick up our camera. I had mentioned the other day that we left it behind at Tana and Graham's, but fortunately they were headed to the same airport the day before us and so they left it at the lost and found for us to pick up there. Had to show some ID and sign some paperwork, and picked it up no problem at all. Our Ryanair flight was scheduled to depart at 2:15pm. Out of all the European discount airlines, Ryanair probably has the worst reputation. They have very strict rules about hand baggage and luggage weight. And you have to print your own boarding pass before arriving at the airport. If you break any of the rules, you will pay extra! But, it's also one of the cheapest airlines around. If you follow the rules, you can fly very inexpensively. We paid €20 each for the flight, and and extra €24 euros to check one bag. A total of €64 ($93 CAD, $71 USD) for the two of us for the two hour flight from Alicante, Spain to Milan (Bergamo), Italy. We checked the one bag, and carried on through security with the other two. We had read where Ryanair had recently relaxed their luggage restrictions and we could probably have gotten away with not paying for the extra bag. We didn't see anybody on our flight getting checked for luggage weight or size. We got to the departure area and sat and used the free internet for a while. We have no problem passing time in an airport. Lots of people watching to be done, and you can walk about the terminal and stretch your legs. It got close to departure time so we made our way over to our gate. We never sit at the gate waiting, we always find an unused gate where there are hardly any people. Well we got there, and all the people for our plane were waiting in line. Well we hate waiting in line, so we just sat down. 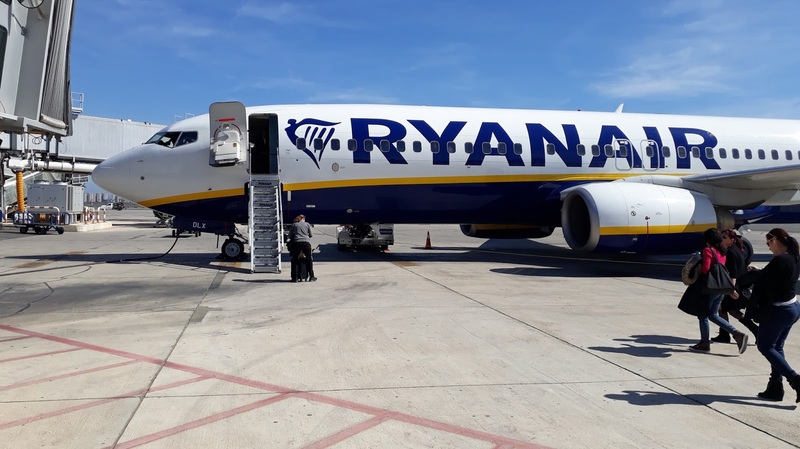 The reason everybody waits in line with Ryanair fights is that they only allow a certain number of carry on bags and you risk having your carry on bag put in the hold if you're one of the last people on. But we don't care because we already had one checked bag anyhow. The plane was late boarding, and so all these people stood in line for well more than a half an hour. Then when it did board, of course they were the first ones on the plane. We were among the last people to get on the plane. Yes, they sure do fit them in tight! My long legs were a little cramped, but for a short two hour flight it was just fine. But, we were going to be delayed taking off. The air traffic controllers are on strike in France and the pilot said something about French airspace. We didn't quite understand, but we were almost a half an hour late getting off the ground. I managed to have a nap, and Ruth read her book. When I woke up, we were approaching the coast in Italy. Soon, we had a nice view of the Italian Alps. We landed at about 4:45pm, and Fernando was there to greet us. 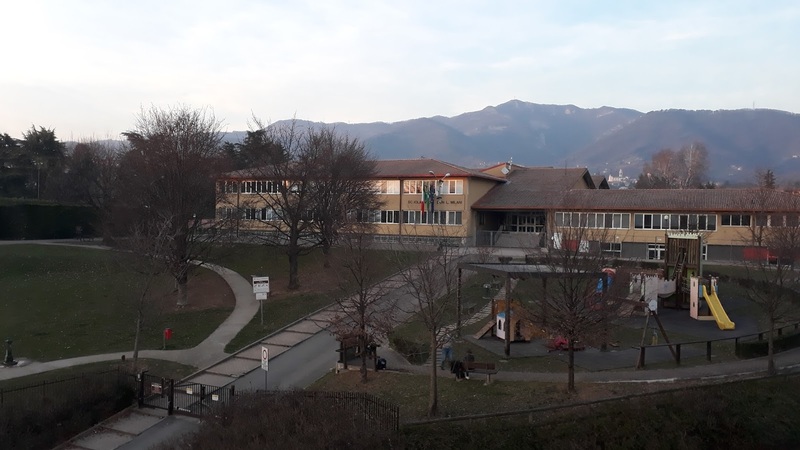 We had booked an AirBnb room in Ponteranica, a northern suburb of Bergamo. As part of the room deal, the host offers pick up and drop off at the airport. Can't go wrong with that! Our room for the next four nights. View out our bedroom window is an elementary school. And there are lots of trails heading up into those hills! Fernando is a really helpful guy, and wants his guests to be happy. He offered to take us grocery shopping, and we accepted. We went to a huge Auchan superstore. Food prices seem about the same as what we had been paying in Spain, but alcohol prices are a little higher. I think we got spoiled in Spain! Back at the apartment, we made a late dinner and had lots of interesting conversation with Fernando. He is about our age, and was born in Peru. He moved to Italy about 25 years ago. He speaks fluent Spanish and Italian, and his English is pretty good but he says he doesn't practice enough. It's a beautiful sunny start to the day, so we're off to do a hike in the hills behind where we're staying! The 20 volt cordless lithium Black and Deckar hand vac is on sale...cheapest it's ever been! I want one for the motorhome! We did see checks for luggage size on both Ryanair and EasyJet! Would of been cheaper to book an extra seat for the bag rather than go in the hold, lol. Enjoy Italy. If we hadn't brought some of the leftover food with us we might actually have been fine with just having our bags as carry on but you're afraid to take that chance because the fine is much bigger at the gate then the cost of paying for the checked bag beforehand. Another step forward having too much fun. Hope you learn some Italian! Of course! You know we always learn the basics of the language in any country we visit. Kevin, there is no doubt Ruth and you have committed to memory some of the language basics, but once you get to the particular new country, we often are each looking at our spouses to help us out when we have a "senior moment" in trying to find in our heads the right word. Don't ask me how I know. Getting older makes these things so frustrating. Thank the Lord for apps on cell phones to relieve some of that frustration. Personally Dee, we don't think that it is having a "senior moment", we think that anyone no matter what age would have problems remembering a lot of the basics when you are traveling through a number of different countries in a relatively short amount of time. In three months we have needed to know the basics of Portuguese, Spanish and Italian. Luckily we have known more than the basics of the Spanish language which has helped to a certain extent with both the Portuguese and the Italian. We find it always takes a few days to adjust and start to feel more familiar with the language when we first arrive in a new country but we try to start and use those basics right away. Translation apps definitely make the language issue much easier but only a few years ago, we would buy a English to whatever language dictionary and would constantly use that. It really helped when we went to the Czech Republic. Isn't life wonderful meeting people in their country and willing to show you the sights. I hope Canadians are equally open to this amazing opportunity of sharing cultures, food and of course wine! I cannot believe how inexpensive the Airbnb is for the 4 nights. I am guessing you have a place to cook since you are buying groceries. Italy looks lovely so far. Looking forward to reading more blogs about your stay! 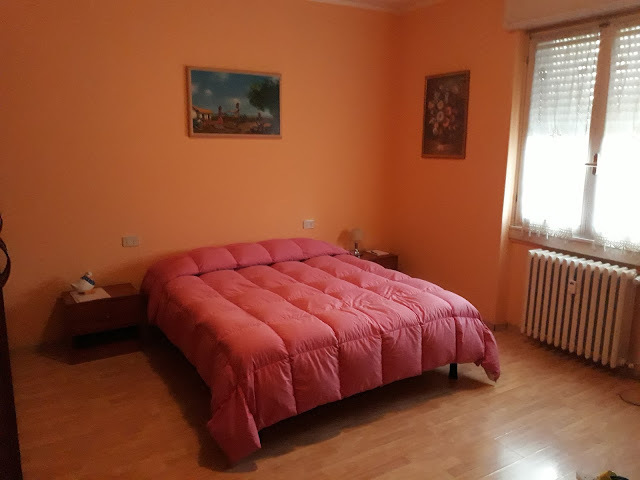 Keep in mind that we share the apartment with our host, generally if you want an AirBnB to yourself you will pay a little more but it is still way better than staying in a hotel, plus you get to meet the local people this way. It also helps because we aren't right in Milan or even Bergamo for that matter. Gorgeous photo of the Italian Alps. It is gorgeous here, especially after seeing the scenery from our hike yesterday! Yes, it is a charmed life but we feel that life is what you make it and if you don't put the effort into it then you won't get as much out of it! Italy is beautiful but I expect that France is as well. Your Orange SIM will run out quickly, trust us!